The boys love loose parts play on the light table, but you may have already figured that out. They have created with cups and stones and have made monsters and robots from loose parts. This latest invitation to play with loose parts on the light table got a little bit colorful, but was nothing but fun for the boys. 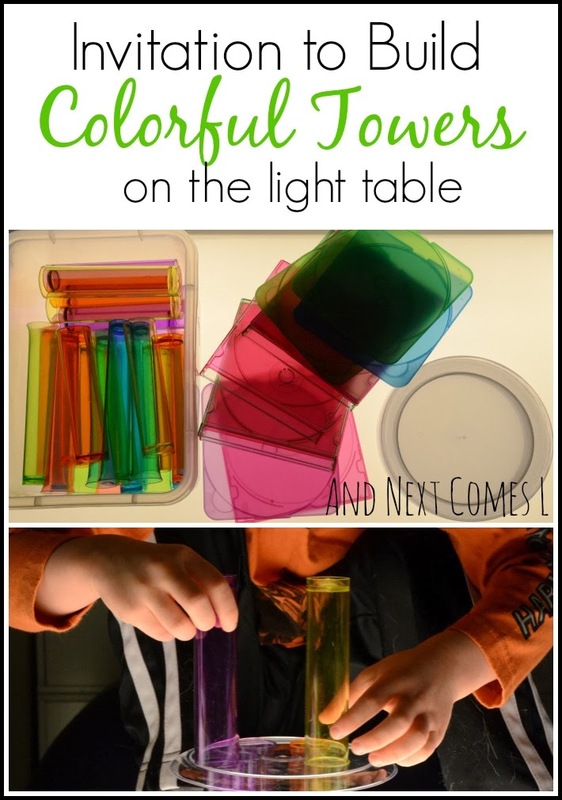 It's the perfect STEM engineering light table activity for preschoolers. I set out colored tube shots, clear plastic plates, and colored CD cases for this invitation. After a couple of failed attempts to balance a clear plastic plate on two tube shots, J eventually figured out that three or four tube shots might be a better base for his colorful tower. And in case you are wondering how his feet are on the table, it's because lately, he likes to sit on an exercise ball while playing at the light table. J soon declared that his tower was actually a birthday cake and that the tube shots on top were birthday candles. And I absolutely love that I was able to capture this amazing photo of the boys blowing out the candles together. After the birthday cake crashed down, the boys started building with the colored CD cases. Or in K's case, he spent time opening and closing, opening and closing, and opening and closing the cases. Finally, the boys spent some time playing solely with the tube shots. We have two different sizes of tube shots so the kind from the dollar store end up fitting inside our Target tube shots. It's a great way to explore color mixing too. So we were able to discuss and see how the colors changed when different tube shots were inserted into other tube shots. Thanks I actually have the tube shots in the drawer under the light table unopened. Other than for colour mixing I was thinking they might be a little teetery for building....of course not. Thanks. So pretty! I love the picture of them blowing out the candles!! So precious!!! I know right?! It is easily one of my favorite play pictures EVER! !